Julian was a gifted missionary priest, scientist, writer, musician and popular lecturer. As a lifelong student of geology, palaeontology and zoology, Julian shared Mary’s commitment to education for the poor. London-born Julian arrived in Tasmania in 1855, aged 23. He was ordained just two years later and appointed parish priest of Penola in rural South Australia. 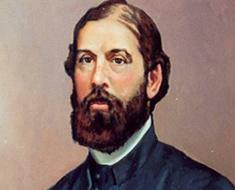 He met Mary in 1861 and in 1866 he invited her to establish the ground-breaking Catholic school in Penola. Together they subsequently founded the Sisters of St Joseph. Julian was then appointed Director of Catholic Education in Adelaide. Like Mary, his life reflects “exuberant industry”. Julian worked tirelessly to extend the kingdom of God in his times. He was creative and innovative in using his talents for the betterment of Church and Society. Underpinning all that he did and strove to be was his unshakeable belief that the Providence of a loving God guided him and pervaded all creation.